THIS WAS OUR FIRST DEAR POLICE DEPARTMENT LETTER, DATED DEC 9, 2014. If you are reading this, then you clearly know what hundreds thousands of us are up to! Being frustrated in seeing what each of you face on a daily basis only to come under fire in the media and beyond, this crazy little idea was born. It was based on the thought of “I know ‘you’. I know the good you do; the bad you face.” So, in order to show you first hand that you are appreciated, baking would happen. This idea was a single idea for a single department. A short time later, this single idea was taken to Facebook to see if a few friends wanted to help. This is when it was realized that there was so much potential to really (REALLY) drive home how much you are valued. This is when Cookies for a Cop was born. At the time of this post, that single idea has multiplied 75+ times!! That is right, 75+ departments in a total of eight (8) states will be receiving sweet thanks from those who value them. THIS HAPPENED IN FOUR DAYS. Being family to a police officer and knowing so many others, I can assure you that we understand some concerns that may come with this type of campaign. In order to best represent, we’ve worked hard to reach out to other family members and dear friends that we know appreciate the current times and the hardships / challenges of your profession. We feel we have connected with trusted friends and trusted friends of those friends. In the end, we can appreciate if this is not a campaign you feel comfortable bringing into your “home”. If that is the case, please be open with us so we can see if other arrangements can be made to make sure your men and women are included in some way of thanks from those in their communities. We appreciate each of you and hope that this small gesture from so many brings a smile to your face and lifts your spirits. ~ From the people you work to serve and protect daily. Thank ALL of You so very much for what you do for us everyday 24×7 365!! 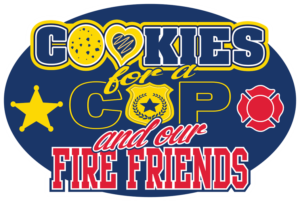 I hope you enjoy all of the cookies that were baked by the members of different communities to show our appreciation to you. I pray that each and everyone of you return home safely after every shift, You are always in my prayers. Wishing each of you a Very Merry Christmas, a Happy New Year and Safety Always!!!!!!!!!!! !